This drama began in the United States Congress over thirty years ago. Tax reform was enacted in 1986 that affected sporting facilities and the cities they inhabited. The use of government bonds - which are exempt from federal taxes - for stadium financing was limited to 10 percent of the projects’ costs on privately-owned facilities. That had a perhaps unintended but nonetheless real effect of making it appealing for cities to own stadiums and use public dollars to construct and/or renovate them. As “public” facilities, there was no cap on the usage of bonds. 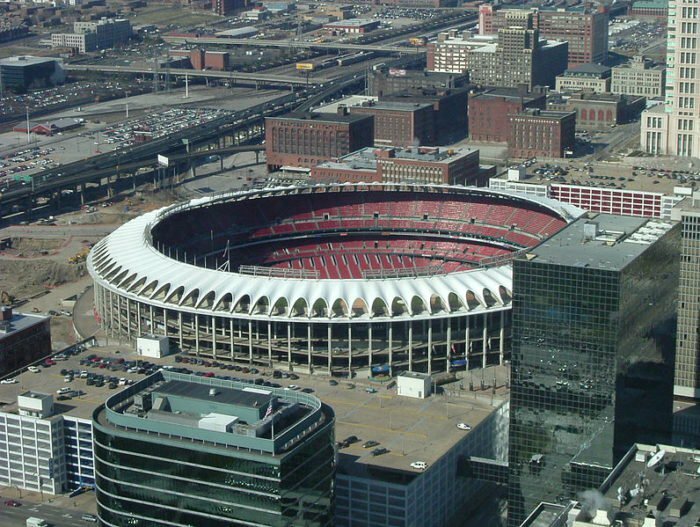 The first serious incident of the battle between city governments and the population at large on a stadium funding issue was in 2002 in St. Louis. The city council in Oct. of that year approved a rebate of a ticket tax to pay for renovations to Busch Stadium, the home of the St. Louis Cardinals. A month later a referendum passed with 55 percent of the vote that required any city funds going toward sports facilities required voter approval. A legal battle followed over the 5 percent rebate for Busch Stadium, which ultimately grandfathered that decision in as not having to face a referendum because the measure was passed prior to the change to the city’s code. St. Louis’ adherence to this requirement hasn’t been consistent since. Just last year, the city council approved $105 million from the general coffers over the next 30 years for upgrades to the Scottrade Center, the home of the NHL’s Blues. The use of those funds for that purpose was not placed on the line for a referendum because of some creative semantics by the city council. The council was able to push the measure through without voter approval because it diverted existing taxes as opposed to establishing a new tax. St. Louis’ city council isn’t the only government body which has used creative strategy to push through fiscal matters which aren’t actual emergencies, however. In other instances the strategies have become more creative. Also in 2017, the city of Cleveland’s city council engaged in some strategy to hand the NBA’s Cavaliers millions of public dollars that required it to sue itself. After the council pushed through a resolution that gave $70 million to the team as a reimbursement for renovations to Quicken Loans Arena, dubbing it an “emergency measure,” a civic group called Greater Cleveland Congregations reacted with some actual action. The group ran a petition drive to enact a provision in Ohio’s state law that required city funding matters to be put up for a referendum and presented the petition with the requisite number of signatures to the council. The council’s chair refused to even acknowledge receipt of the petition into the record, much less begin the process of organizing a referendum on the money for the Cavs. In response, Greater Cleveland Congregations filed suit against the city to force the referendum. In the game of legal chess, one branch of the city government filed suit against another in the Ohio Supreme Court. It was a stroke of evil genius. Not only would the result be essentially beyond challenge as it would come from the state’s highest court, but because the city was both defendant and plaintiff, it could effectively throw the case. Greater Cleveland Congregations petitioned the court to join as a plaintiff, and was granted that request. The Supreme Court ruled in their favor, and it appeared democracy had won. The issue of whether that $70 million would be handed to the Cavs would be put up to a public vote. The victory was short-lived and largely immaterial, however. A few weeks later, Greater Cleveland Congregations withdrew its petition after the Cavaliers pledged more resources to community projects. In the end, the Cavaliers got what they wanted and democracy turned out to be naught more than a delay. Perhaps partially because of that compromise by Greater Cleveland Congregations, another city in Ohio has gone down the same path less than a year later. Cincinnati’s city council in April passed an “emergency measure” to fund the construction of a new stadium for FC Cincinnati, which will soon be an MLS franchise. The reason the measure was pushed through despite community objections and without the requisite council votes needed for the emergency designation was to avoid a public referendum. It’s yet to be seen whether there will be any challenges to the measure in court, as favorable precedent now exists with the state Supreme Court, but the lack of serious consequences for such shady behavior should be pointed to in discussion of city council members’ motivation to make such a move. Because small numbers of voters have failed to hold these members of city government accountable and the general population in droves fails to bother to show up for city elections, there are virtually no unwanted consequences for lining the wallets of sports franchise owners with the dollars of the general population. In that regard, populations of cities get exactly what they deserve when their councils act without any regard for the approval of the larger population. As long as the vast majority of the populations of cities which professional sports franchises inhabit continue ignoring the proceedings in their city governments, engrossed in their bread and circuses like Laputans mentally adrift in metaphysical philosophy, those governments will continue to act in the best interest of the few who are involved and conveniently stand to profit from those acts.